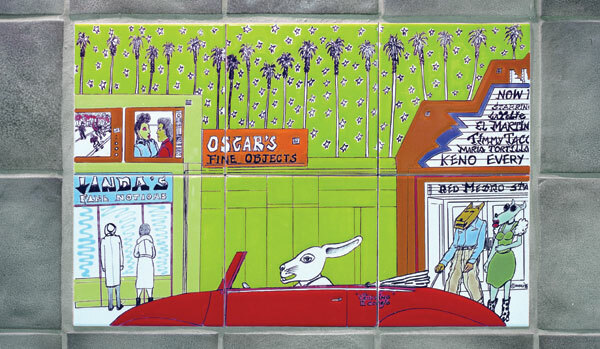 One of the most famous intersections in the world—Hollywood and Vine—is the site of this station designed by artist Gilbert “Magu” Lujan in collaboration with Miralles Associates, Inc. Artist and architect worked together to evoke the history, glamour and excitement of the Hollywood film industry’s yesteryears and its great movie palaces. 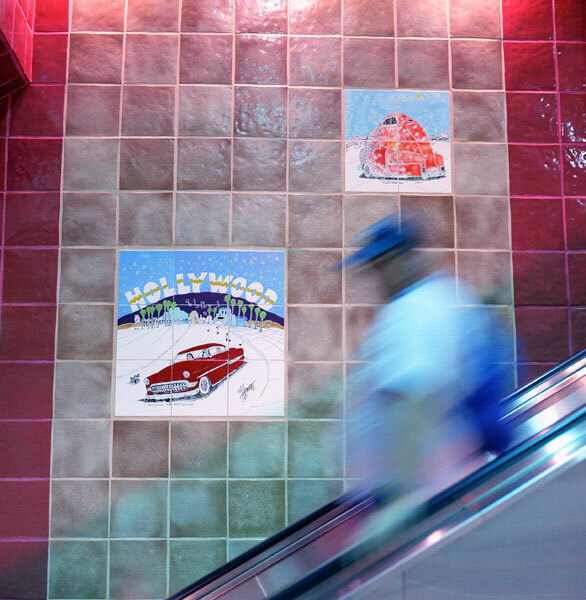 From the street level plaza down to the subway platform, passengers follow pass by 240 hand-glazed art tiles on the station walls. The interior handrailing design houses the musical notes to the song “Hooray for Hollywood.” The interior of the station contains various artifacts and references to the film industry. Film reels cover the ceiling while two original film projectors from the 1930s, donated by Paramount Pictures, are on exhibit. Collaboration with Miralles Associates, Inc., Architects. MIRALLES ASSOCIATES, INC., based in Altadena and founded in 1972, is known for master planning and design of public facilities and for pioneering the use of innovative design and application of energy efficient technologies. In addition to a number of transportation projects, the firm has worked on water purification facilities, schools, park facilities, and visitor centers. Adolfo Miralles served as lead designer on the project. GILBERT LUJAN was born in Stockton, CA and attended East LA City College, Cal State Long Beach, and the University of California, Irvine where he received a Bachelor of Arts in ceramics and a Master of Fine Arts in sculpture. 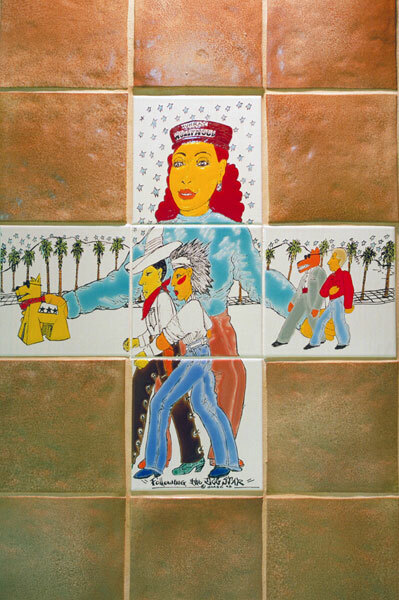 Lujan, who went by the nickname “Magu,” was a member of the noted Chicano art collective “Los Four.” His work has been exhibited at the LA County Museum of Art, the Corcoran Gallery in Washington, the Brooklyn Museum in New York, the Houston Museum of Fine Arts in Texas, and many galleries across the country. Throughout Lujan’s work one can find references to car culture and hot rods, Mesoamerican forms, Chicano symbols, and personal inventions such as his anthropomorphic dogs juxtaposed in fantasy scenes. Lujan passed away in 2011.